BAR HARBOR — Julia Freifeld of Raleigh, N.C., knows where the Obamas will make a stop during their weekend getaway on Mount Desert Island. She’s staked out Ben & Bill’s Chocolate Emporium on Main Street in Bar Harbor. “They are going to bring their daughters here,” she said this afternoon. 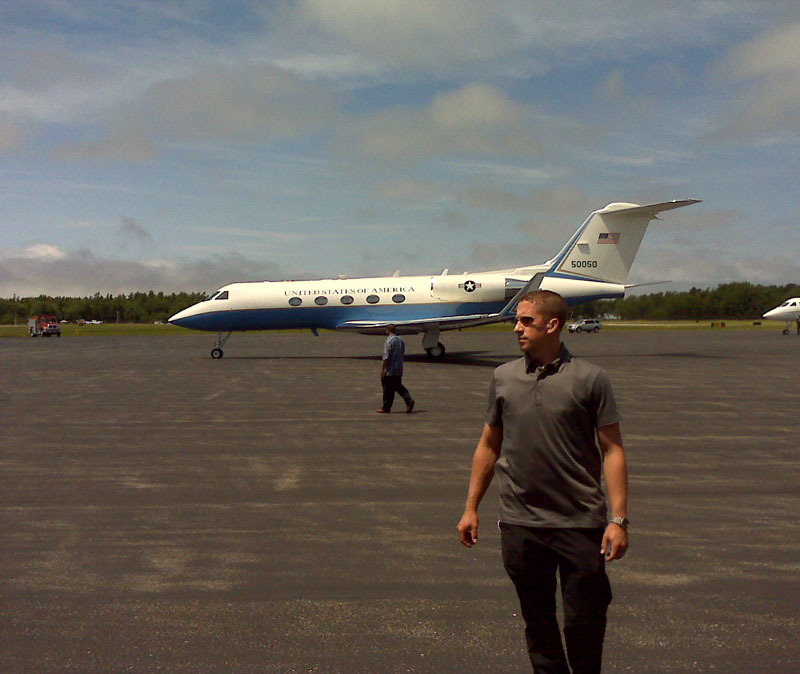 Obama's plane, Gulfstream G3, taxis on arrival at Hancock County-Bar Harbor Airport in Trenton. Walking down the streets of the popular tourist town, it was obvious that everyone knew where the president, first lady Michelle and daughters Malia, 12, and Sasha, 9, had been or were going, or thought they did anyway. As it turns out, the first family was just down the street having ice cream at Mount Desert Ice Cream, according to the White House pool report. Freifeld, her husband, Mark, and his brother Richard are staying on the island through the weekend, on the couple’s second trip to Maine. 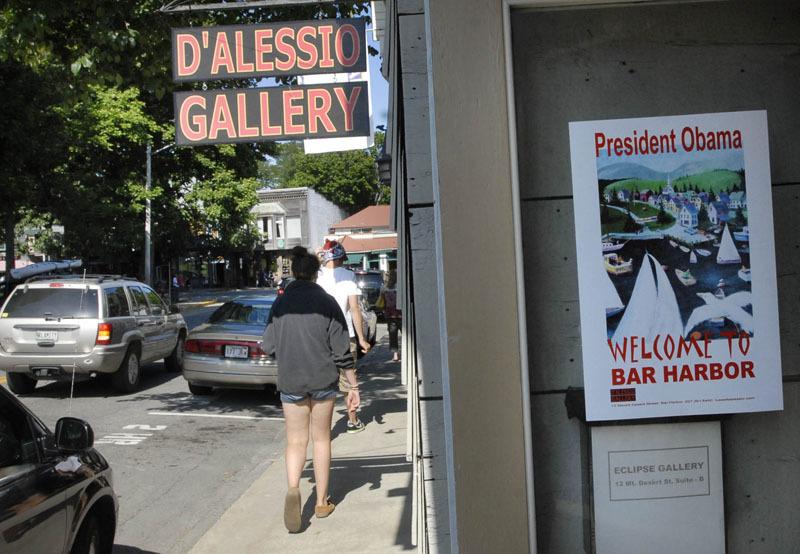 “It’s charming, scenic and beautiful,” Julia Freifeld said of why they chose to revisit the popular vacation spot. 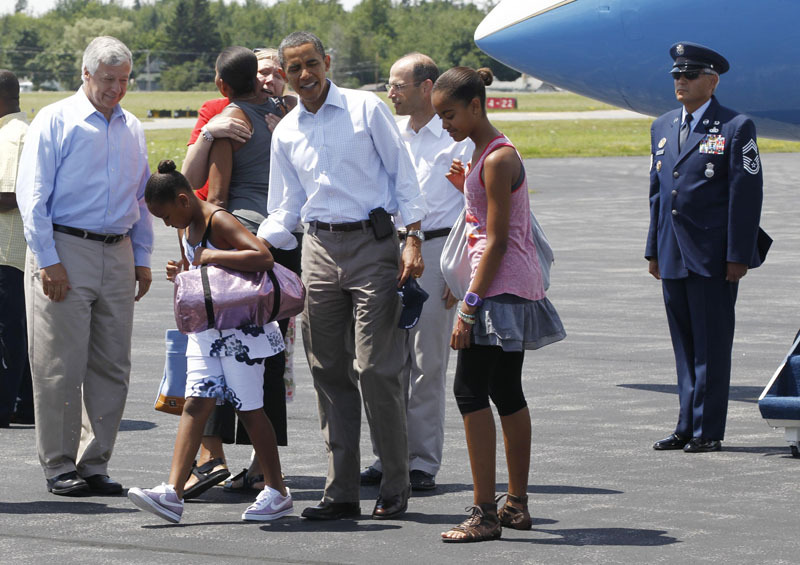 Earlier today, the Obama family was greeted by Gov. John Baldacci and U.S. Rep. Mike Michaud, a Democrat representing Maine’s 2nd Congressional District, when they arrived in Trenton at about 12:25 p.m. 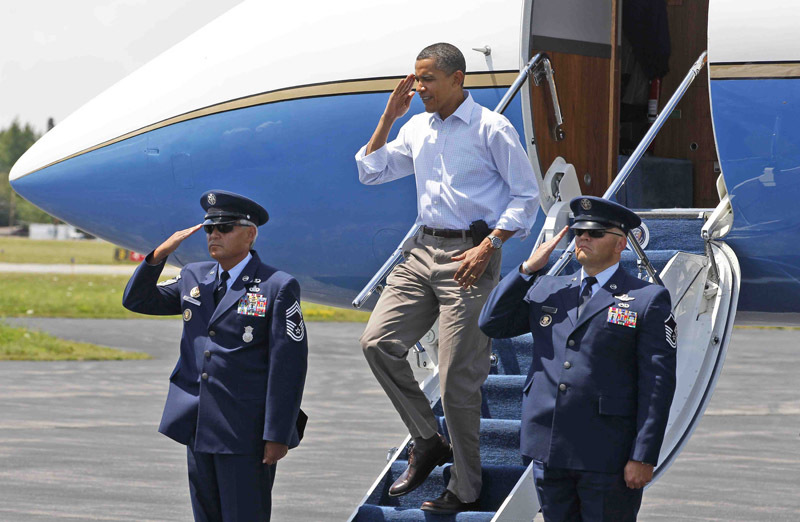 The president was the first to walk onto the tarmac, dressed casually in a pale blue Oxford shirt and khakis. A few minutes later, first lady Michelle Obama, dressed in black capris, a tank-top and sandals walked onto the runway. Shortly after the Malia and Sasha joined their parents. Baldacci and his wife, Karen, presented the first family with gift bags full of Maine-made goodies, including baskets made by the Passamaquoddy Tribe, popcorn from Little Lad’s Bakery in East Corinth, iconic L.L. Bean bags, University of Maine ice hockey hats and an assortment of other Maine foods and books. Karen Baldacci said the bags for Malia and Sasha contained one loon and one chickadee toy that sound their natural calls. Arriving in a small jet prior to the Obamas, was the first dog Bo, a Portuguese water dog given as a present by the late U.S. Sen Ted Kennedy, D-Mass., and the president’s personal aide Reggie Love, who chatted with Baldacci. “We’re ready, we’re going to do it all,” he said with a big smile. 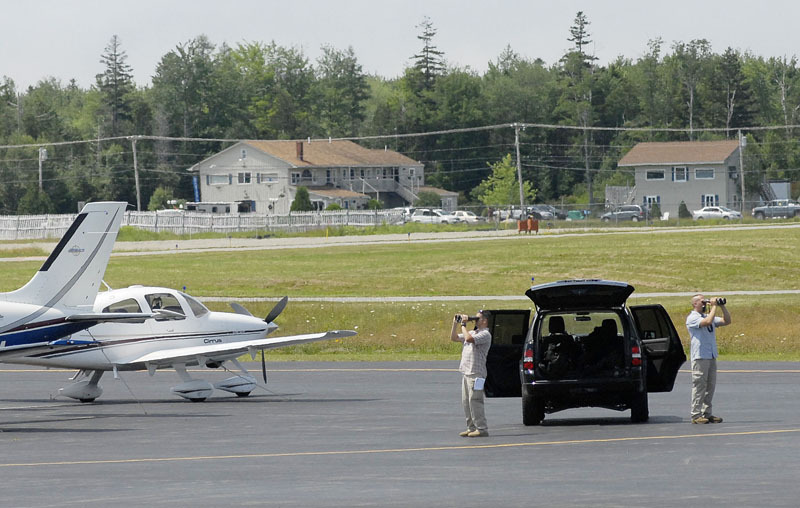 Air traffic at the small Hancock County-Bar Harbor Airport in Trenton was shut down for the presidential arrival. 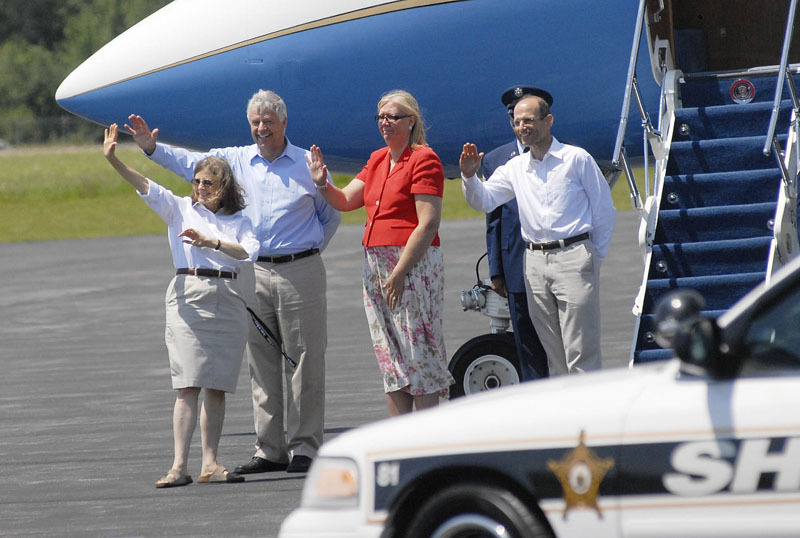 A U.S. Coast Guard helicopter patrolled the air in anticipation of the first family’s touchdown and a pair of local fire rescue trucks manned the otherwise empty tarmac at the private air hangar. 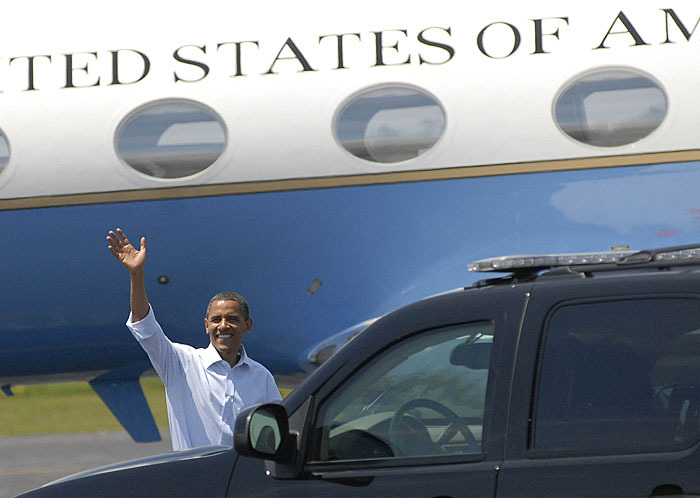 The Obamas traveled to Mount Desert Island in a motorcade of at least 16 vehicles. 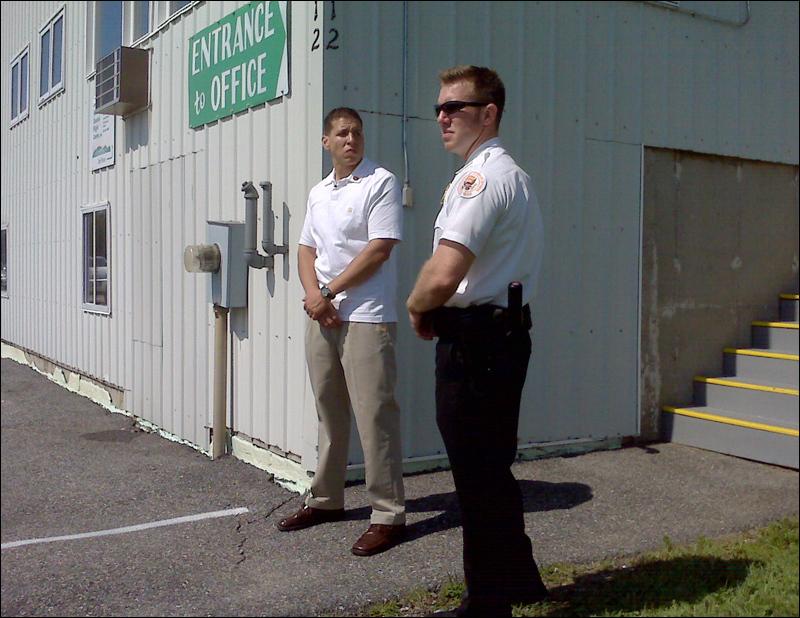 It was led by two Maine State Trooper cars and included five black Chevrolet Suburbans. The early morning fog quickly burned off and the sky was bright blue for the arrival of Air Force One, which in this case was a G3 Gulf Stream. Technically, Air Force One is whatever aircraft the president is traveling on, though it usually is a 747, but that size plane was too large for the Trenton airport runway to accommodate. Dozens of members of both local and national media were on the tarmac to capture the Obamas’ arrival. Before even making a stop at their hotel, the Bar Harbor Regency on Route 3, the first family went biking for more than an hour around Witch Hole Pond in Acadia National Park within 40 minutes of arriving on the island. They proceeded straight up Cadillac Mountain, which at roughly 1,500 feet is the highest point on the Eastern Seaboard. At the summit, the first family was given a personal tour by Acadia Superintendent Sheridan Steele and talked to several families who happened to be touring the mountain at the time. The Obamas then took a leisurely stroll along a lower pathway offering stunning views of Frenchman’s Bay. Walking by themselves as spectators and media watched from a distance, Barack and Michelle Obama held hands for a spell as they strolled along the path, with Sasha and Malia trailing closely behind. Kevin Miller of the Bangor Daily News, representing Maine in the White House Press Pool, contributed to this report.